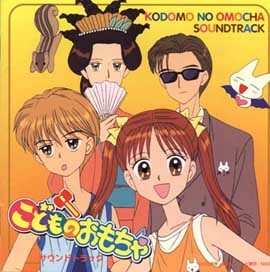 Kodomo no Omocha anime and manga series by Obana Miho images and info. Part of a diverse shoujo anime, manga, video gaming, and live-action Japanese drama website. 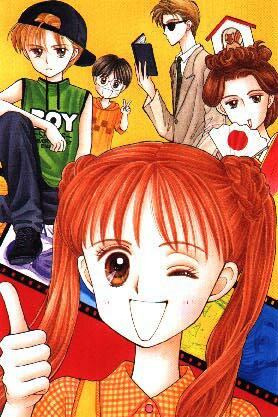 "Kodomo no Omocha" is the hilarious story of Sana, a young student and famous actress, and Hayama, a troubled boy she befriends after he has caused trouble at school. 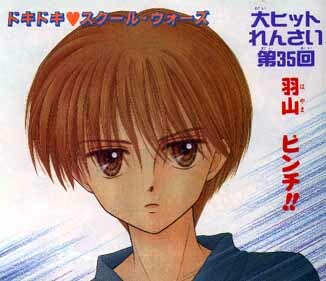 The manga is by Obana Miho (Kono Te wo Hanasanai, Partner, Setsunai ne), which ran in the manga magazine Ribon. 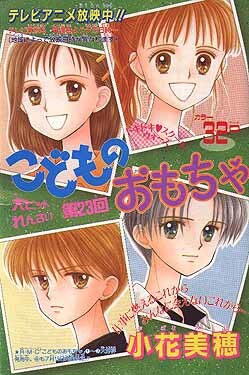 After completing the series, Miho-sensei created a manga called "Mizu no Yakata", telling the story of a drama movie that Sana and co. starred in... the characters of this book look exactly like them! Kurata Sana is a vibrant 6th grader who also happens to be on the TV show called Kodomo no Omocha. She's really popular with lots of fans, and she also does commercial work and is active in a theatrical company. She likes to create ultra-fast, tongue-twister songs everyday and talk to people. Rei is her sunglasses-wearing driver, manager, and boyfriend. Sana's loving mother is an Aoki award winner (like the Japanese equivalent of the Pulitzer prize) and wears strange hairstyles and a pet squirrel in her hair. This extremely wacky and fast-paced series starts when Sana has had enough of the boys in her classroom. Mainly, their leader Hayama Akito. "You should have never been born!" she hears a voice yelling. "Demon! Son of a devil! Get out of here!" Tsuyoshi explains that it's Hayama's older sister. She often becomes enraged and yells at her brother because their mother died giving birth to him. She blames Hayama. Hayama slams his hand against a lamp on the wall and Sana sees it starts to bleed. His father comes home and silently walks into the house. Tsuyoshi fills in that the two never speak. Sana is aghast. It's just like the tragic character of the gloomy drama she is supposed to star in for TV! Still determined to fix the problem at school, Sana manages to surprise Hayama in the park and get an embarrassing photo of him (idea helpfully provided by Rei). Now if the boy does anything bad, she'll show it to everyone! The plan is effective, but Sana notices that Hayama has becomes a loner. Sana offers to help him in any way that she can, suggesting to solve the problem and get happy. "Anything?" he asks. Sana agrees. "Kill me." Hayama holds up a knife and places it in her hand. "What's wrong with you?" Sana cries. "Can't you think of anything better than that? That is... that is stupid!" "So you won't do it?" "Of course I won't! .... I give up. Go kill yourself, why don't you! I'm not going to help you. Go smash your head on a brick of tofu and die!" Hayama stares at her, sullen. "Haven't you ever wanted to die?" "No!" Sana can't imagine such a thing. "You and I are too different," Hayama says, as if he already suspected as much. "Isn't it impossible to have a conversation between us? You always think you're right, huh? But don't give me that! It's irritating! Go enjoy yourself and mind your own business. You'll never understand how I feel!" "That's true," Sana agrees sadly. "I don't have an inkling of how you feel. That's why I wanted to understand you and help you." Sana resolves to go all-out for her performance in the TV drama, and then have Hayama's family watch it! She's sure that if she does her best acting and can portray the emotions of the story, it can help their relationship. On the evening the drama will air she goes to their house, but Hayama isn't home! Sana rushes out into the night to search for him. When she finds him in the park, they have a talk. Sana pretends to be a mother for him since he never had one.... but Hayama wants no part of such silliness. "The photo!" Sana threatens, so he gives in. "Aa-chan," she coddles him, making him lay his head on her lap. "Your mother loves you. That's why I did my best to give birth to you," she repeats lines from the drama with sincerity. "So please, be strong and live for me and yourself." Days later, for a social studies field trip, Sana's class visit the Shinjuku City Hall Observatory. After going up the elevator she notices that Hayama looks sick. She gets him a cold juice and takes it over... but trips and it ends up pouring on his head! Sana apologizes and leans down and wipes his face with a napkin. Hayama looks up and kisses her. 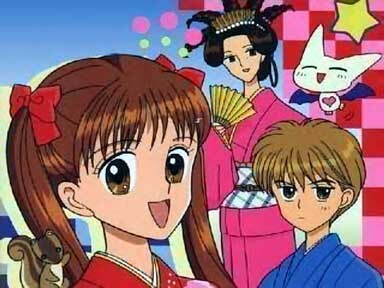 And so begins one of the funniest anime of all time. Besides the uncontrollable humor, dramatic moments give the story a lot of depth. Not a series to be missed!